She narrowly lost the party's leadership race to Doug Ford. Christine Elliott participates in an Ontario PC leadership debate in Ottawa on Feb. 28, 2018. 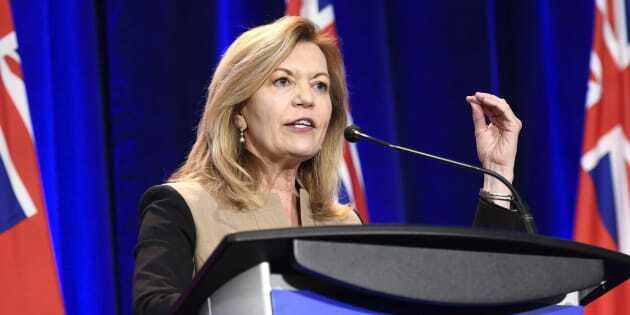 TORONTO — Former Ontario Progressive Conservative leadership candidate Christine Elliott says she will be seeking the nomination to run as the Tory candidate in the provincial riding of Newmarket-Aurora. Elliott narrowly lost the PC leadership race on March 10 to Doug Ford and initially questioned the results of the vote before conceding nearly a full day later. Elliott — who represented the riding of Whitby-Oshawa from 2006 to 2015 — has mounted two other unsuccessful bids to helm the party. In 2015, she also lost to Patrick Brown, the man whose abrupt resignation as party leader in January triggered the latest leadership race. In the most recent contest, Elliott also ran against Toronto lawyer and businesswoman Caroline Mulroney and social conservative advocate Tanya Granic Allen. Elliott's announcement Monday comes a little more than two months before Ontarians head to the polls. "I have never been more convinced of just how much Ontario needs us," Elliott said in a statement. "To all residents of Newmarket-Aurora, you can count of me do everything I can to fight for you at Queen's Park. I hope I can earn your trust." Elliott has worked as patient ombudsman for the province, a position that left her open to critiques that she accepted a patronage appointment from Liberal Premier Kathleen Wynne. The 62-year-old is also the widow of long-time former federal Finance Minister Jim Flaherty, who died in 2014.